This past week was productive. I handed in all of the artwork for Magpie’s Ladder (my forthcoming short story collection) to PS Publishing. Unfortunately I can’t show it to you yet, though if you follow me on Instagram you might have glimpsed some of the work in progress. 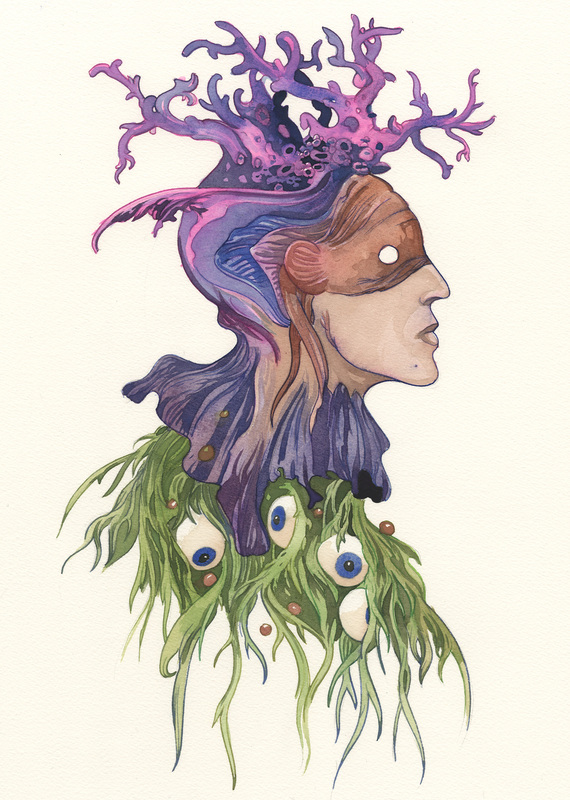 Instead, I am showing you this new watercolor piece called Crown of Coral. After a long, monochromatic winter I am in the mood for some color work. I hope you enjoy this piece. I have made it available on my Etsy site for a low price. Work continues on edits for my new novel, Tailor of Echoes. I am showing you an illustration I did for the forthcoming Houses Under the Sea by Caitlin R. Kiernan (the image is shown as a crop in the link). This is the first time I have illustrated a book using carbon pencil instead of ink. It was an interesting process as the medium took the drawings in a different direction. I will definitely play with this in future projects. I’m still working on illustrations for my own book, Magpie’s Ladder, which will be published later in the year. In May, I will have work in a show at Copro Gallery in California. The show is Roadside Attractions III, curated by Cris Velasco. Further to my last post, PS Publishing has just posted its December newsletter. It includes the full wrap around illustration for Odin’s Girl by Kim Wilkins, which I share here. It also shows a little of an interior illustration, which you can see by following the link. I am currently hard at work/ play creating the illustrations for Magpie’s Ladder (also mentioned in the newsletter). I will be posting some teasers on my Instagram account. So if you are interested, please follow me there. The link is at the bottom of this page. Finally, I would be remiss not to throw in a plug for my novel Necessary Monsters published in June by Resurrection House. You can find it on Amazon or, in your local bookshop of choice. PS Publications will be publishing my illustrated short story collection Magpie’s Ladder in 2018! I’ll post news about that project here as details become available. In the meantime, have a look at these two forthcoming titles from PS featuring my artwork and great cover design by Michael Smith. Give the PS site a visit if you have a few minutes, the catalogue is fantastic.